Last time I updated the blog I was in Carbondale, IL. It was a small university town with several bike shops and pubs, which was a pleasant commodity considering the fact that I had been riding through dry counties for days! A few days later I have crossed the Mississippi River into the state of Missouri. 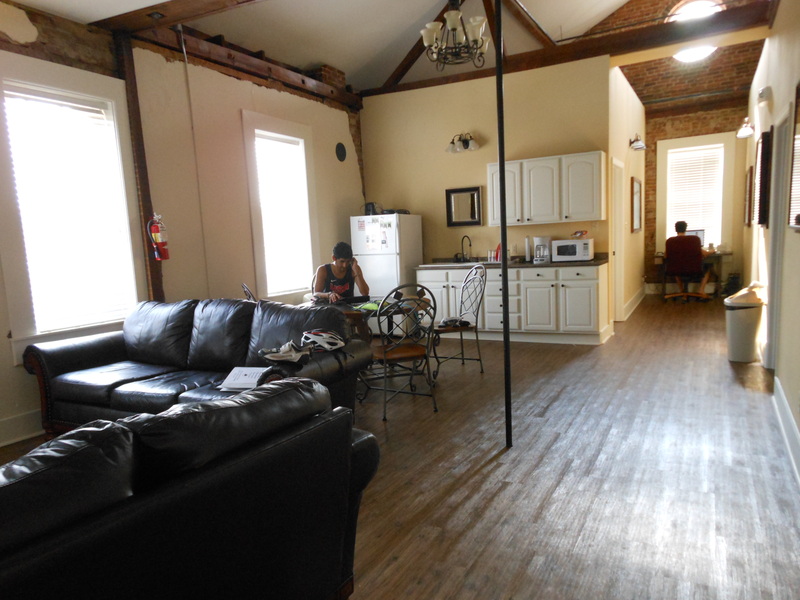 When I was in Carbondale I stayed with a WarmShowers host who also hosted two other cyclists that night. There was British and a Slovenian guy traveling as a pair. I thought they had been riding together the whole time by the way they interacted with each other, but it turns out they had only ridden a couple of days with each other by the time that I met them. We had beers at the pub next door to the bike shop and later went out for pizza. We were all ready to pass out by 9:30 in the evening, and we did. We woke up at 4:00 in the morning the next day to try to beat the heat. They were traveling East bound, so we went our separate ways. 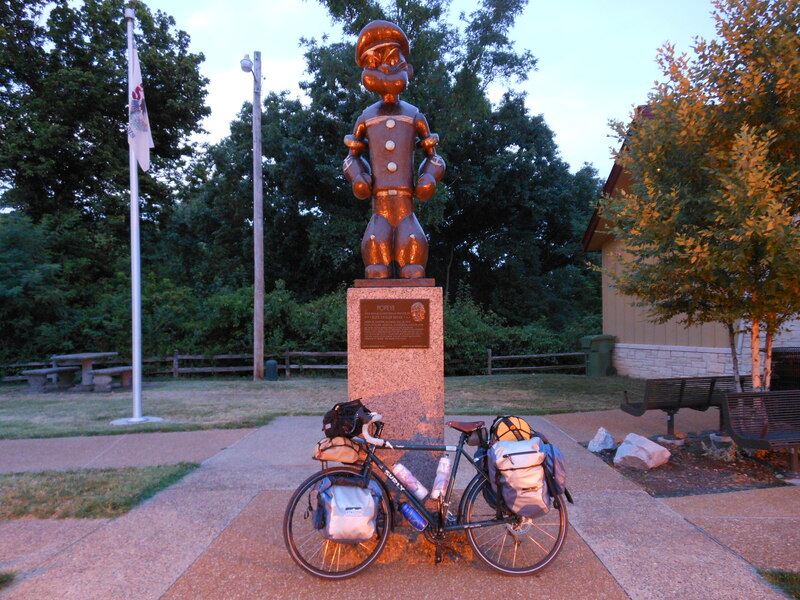 That day I rode to Chester, IL, which I soon learned is the hometown of Popeye the Sailor Man! There were all kinds of statues and murals throughout the historic downtown area. That evening I stayed in a tiny cabin provided by the Fraternal Order of the Eagles. I guess it’s some sort of private club and if you pay dues then you can go to their bar. bar. They were really nice folks. They seemed like the motorcycle type and enjoyed helping out the cyclists, especially with the drinking part! The bartender put the first two gin and tonics on the house! It was the perfect drink after riding in that heat. A little later on my cycling buddy, Tyler, showed up. We did our own thing for a few days. It’s really nice to ride alone because you have no obligation to ride with anyone else, but it’s always fun to be in the company of other cyclists on a regular basis. That evening another cyclist named Steve, he’s a Canadian guy, arrived. I didn’t get to chat with him much. He was pretty worn out and went to bed early. Yesterday I woke up at 4:30 and left Chester by 6am. Tyler and Steve were still sleeping in their bunks, but I decided that it’s definitely worth it to go ahead and leave and not deal with the heat. That morning I got to see the Popeye statue that all the locals were talking about. He sits in a little garden right before the bridge that crosses the Mississippi. I crossed into Mississippi and rode flat land for 12 miles and then started making my way into hillier country. From here on out until Western Missouri I’ll be riding through the Ozarks… I’m hoping that they are easier than the Appalachians! On my way into town I passed a little goat farm, a lot of chickens, one dog, a winery, a brewery, a tiger sanctuary (! – I almost stopped to see the tigers, but they weren’t open yet), and some bad drivers. The town that we stayed in had a really awesome cyclist only hostel! When I arrived there was another westbound cyclist, named Michael, taking a rest day. A little later Tyler came into town, too. There were nice showers and I shaved my legs for the first time in weeks! Tyler and I saw a movie at the local theater and that evening I cooked tacos for everyone. Well, I need to get going. The bike shop across the street just opened and I want to get a different pair of shamois. As much as I love my TVB race kit, the bibs and jersey are way too hot for this 100F weather. Today is the first day that the forecast isn’t supposed to break 100! Wahoo! It might even stay below 90! Also, I’ve had just one (yes ONE) beer donation! I’ve traveled over 1200 miles, there should be at least $1200 donated by now! It’s also totally my fault because I haven’t been promoting the fundraiser AT ALL. But I’m going to try to do a better job at it now. If you don’t know what I’m talking about click on the “Buy me a Beer” tab and find out! It’s for a good cause! I promise. It’s almost too hot to ride.